Weather forecasts become essential reading when you have the rainy day pleasure of using the Winsome Memphis Coat Tree and Umbrella Rack. 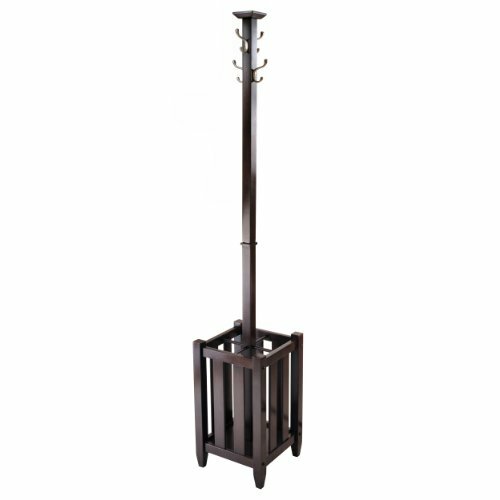 This luxurious umbrella rack features durable wood construction in a rich cappuccino finish, with four satin nickel-finished hooks for hanging coats, scarves, and more. About Winsome Winsome has been a manufacturer and distributor of quality products for the home for over 30 years. Specializing in furniture crafted of solid wood, Winsome also crafts unique furniture using wrought iron, aluminum, steel, marble, and glass. Winsome's home office is located in Woodinville, Washington. The company has its own product design and development team, offering continuous innovation. Crafted from sturdy wood in cappuccino finish. Features 4 double hooks in satin nickel finish. 4-sections at the bottom for holding umbrellas. Some assembly required. Dimensions: 12.91L x 12.91W x 71.52H in..